Sometimes you go to lunch. Sometimes you have a “dining experience”. This Friday was definitely the latter. It being Friday, and me being bored, I headed up to Gainesville, GA (about 70 miles northeast of Atlanta) to sample some barbecue. 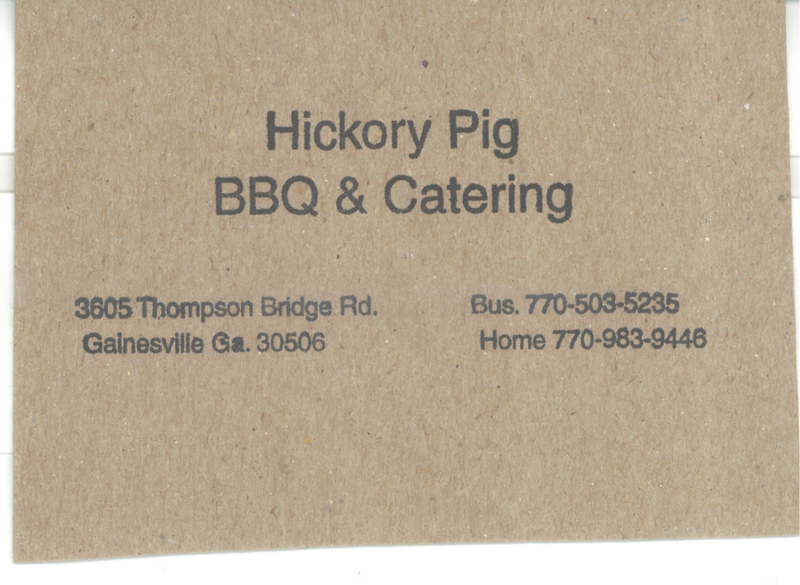 You see, in May, 2011, Atlanta Magazine named the Hickory Pig in Gainesville as the best barbecue in Atlanta. When someone makes that claim you just have to check it out. I arrived at a place that looked like a hole in the wall, if there ever was one. 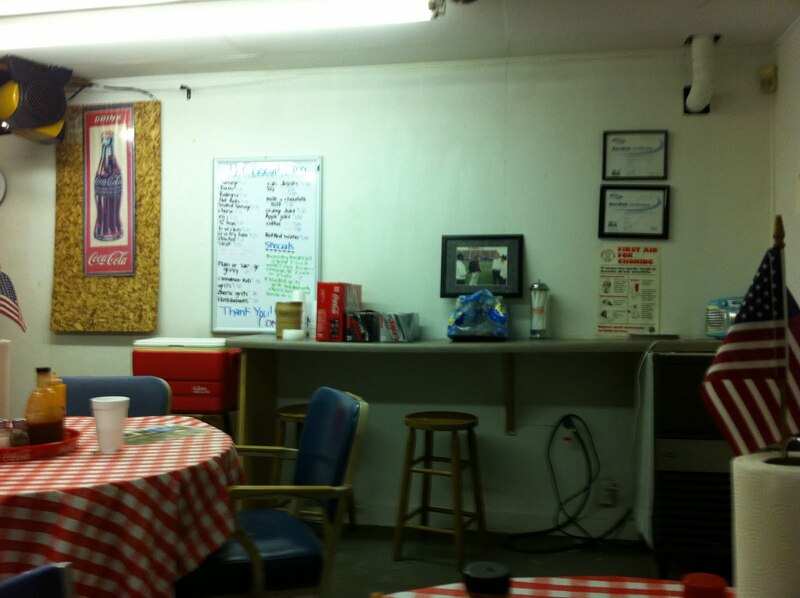 Inside the windowless room, there were three round tables and about fifteen chairs. Here is the right side. On the left side was a doorway which led about 6 feet to a screened door going out back. Halfway down that hallway was an opening into what looked like a kitchen from the late sixties – counters on both side, a small fridge and lots of pots. The menu, such as it was, was on a chalkboard by the door. I talked to the man in the kitchen, who turned out to be Phil (the owner and pitmaster) and told him I wanted ribs and brisket in whatever the best configuration would be. He suggested a plate and I agreed. The waitress said “Take a seat and I’ll bring it to you. Grab whatever you want to drink from over there.” “Over there” was an igloo cooler full of ice and a metal scoop, two twenty four packs (Coke and DIet Coke) and gallon milk jugs of sweet and unsweet tea and lemonade. I took a seat at the table and eavesdropped on the three regulars sitting there. They were locals, discussing gas prices and the local bank. 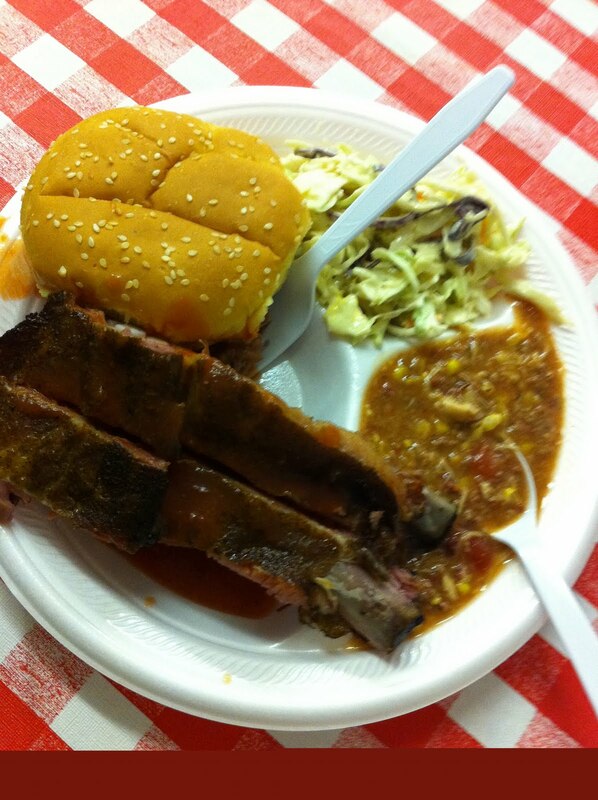 The waitress brought my plate – two ribs, two slices of brisket, a grilled bun, slaw and Brunswick stew. I don’t like Brunswick stew, generally, but this was good. A good sign. The brisket was moist, slightly fatty and tasty. Then I took a bite of rib. Damn! So I took another bite. Double-Damn! 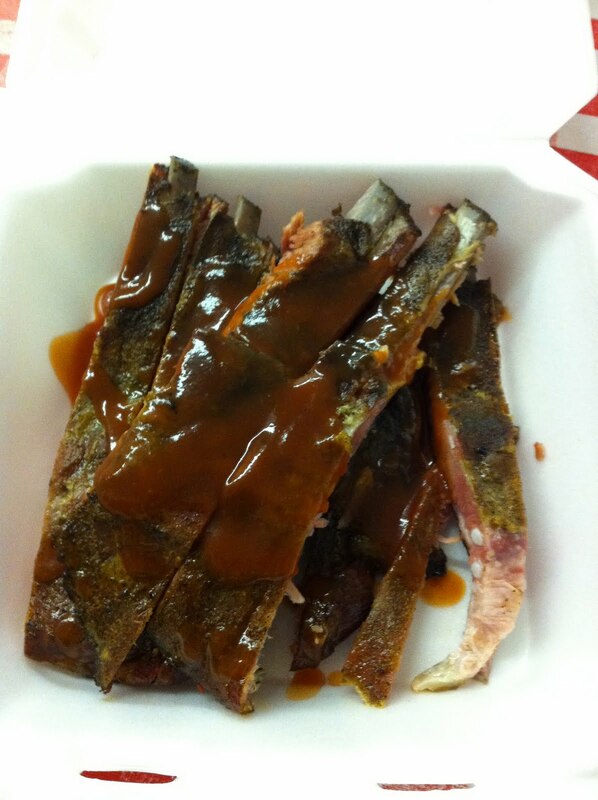 These were the best ribs I’ve eaten in Georgia, ever (and I eat a lot of ribs). So I finished the plate and ordered some dessert – a half rack of ribs. Phil comes out of the kitchen and sits down with Ben (my new friend) and starts to talk about barbecue. His take – “There is no secret. No rub. No sauce. Just hickory wood. Lots of it. And a wheelbarrow . Actually, it has to be a red wheelbarrow.” We talk about Georgia barbecue and some of the classics from the 70s and 80s (Melears, the old Sprayberry’s in Newnan, Fresh Air before the kids took over, Harold’s). I LIKE this guy. Ben, who had been eating a “parfait” (pork barbecue, with hot sauce, covered in slaw from a 16oz. cup) joins in. Ben walks out the door and the waitress asks me if I saw the article in Garden & Gun. I did, but didn’t remember that they were in it. I ask for what. “The pork sandwich.” I order one of those to go. Ben walks back in with a guitar case, pulls out an Alvarez (80s vintage, looks like a Epiphone Howard Roberts Fusion) and starts to tune up. We discuss his Snark tuner. 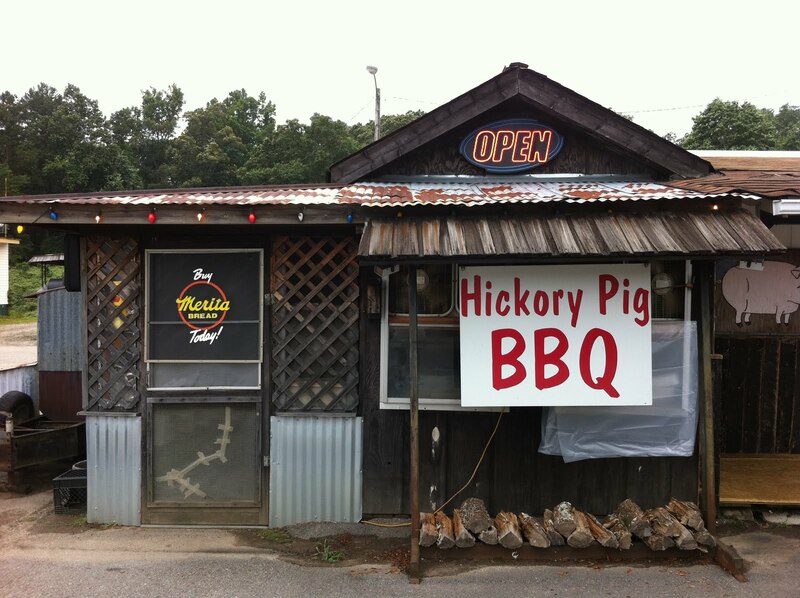 Then he sings, “Down at the Hickory Pig”. I finish the ribs. He finishes and we’re chatting, “You know, if you sing, your barbecue is free.” (Phil is shaking his head NO). Being the shy guy I am, I take the guitar and sing something. When I get done, I go to get my Diet Coke and there’s a 6 oz bowl that appears to be full of whipped cream. Phil had been sitting there when I was singing, I ask him if he left it there and he tells me that I “need to try it”. It was “semi-homemade ‘nanner pudding.” It was pretty close to Strawberries On a Cloud. I finish and ask him what the bill is, he walks over leans in and says “$20, and we’ll call it even.” Triple-damn! As I’m walking out the door, he catches me. In his hand is a 12 x 12 piece of cardboard and a pair of scissors. He then cuts me out a business card, telling me I might need it. Best time I’ve had out at lunch in years. I live about 40 minutes away, I get to the Hickory Pig a couple times a week. I HAVE BEEN TO OVER 2000 BBQ JOINTS IN THE STATE OF GEORGIAIN THE PAST 30 YEARS, AND THIS PLACE IS A TOP 5 JOINT TO BE SURE. I EAT HERE OFTEN, AN HAVE NOT ONCE BEEN DISAPPOINTED WITH SERVICE, FOOD, QUALITY OR SIZE IN THE PAST 20 YEARS. THE BEEF JERKY IS NOT TO BE BELIEVED IT IS SO GOOD! GOOD HOSPITALITY TOO!